February 23, 2015 – A big, bright James Webb Space Telescope “STTARS” is now deep in the heart of Texas. The Space Telescope Transporter for Air Road and Sea (STTARS) is a giant white shipping container with a very important cargo: a test model of part of the Webb telescope, called the “Pathfinder Backplane.” This new NASA video shows its arrival at NASA’s Johnson Space Center in Houston on February 5, 2015. The Pathfinder Backplane is a practice section of the James Webb Space Telescope. To ensure the telescope will operate at its frigid destination 1 million miles out in space, it must complete cryogenic tests. The biggest cryogenic test occurs at Chamber A at Johnson, the same vacuum chamber where Apollo spacecraft were tested. “The James Webb Space Telescope is the biggest telescope for space that’s ever been built,” said Andrew Booth, pathfinder lead optical engineer at NASA’s Goddard Space Flight Center in Greenbelt, Maryland. But its enormous size means special accommodations to move it halfway across the country. Enter STTARS. The journey began in a clean room at Goddard. The massive shipping container entered the clean room floating on air pads, like a puck on an air hockey table. Then engineers lifted and lowered the 3,000-pound honeycombed Pathfinder Backplane by crane into the container. Once the container exited the clean room, hydraulic adjustable wheels were attached, and the whole thing was hooked up to a semitruck engine. 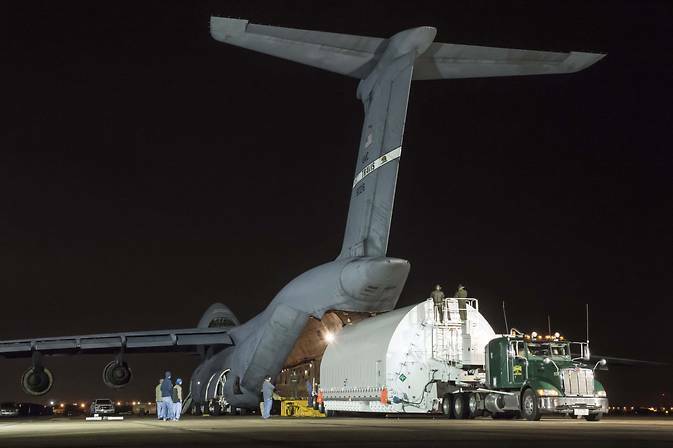 By midnight, the STTARS was on its way to Joint Base Andrews in Maryland – very, very slowly. Traveling at 5 mph, the STTARS team walked alongside the container making adjustments along its seven hour-long journey. 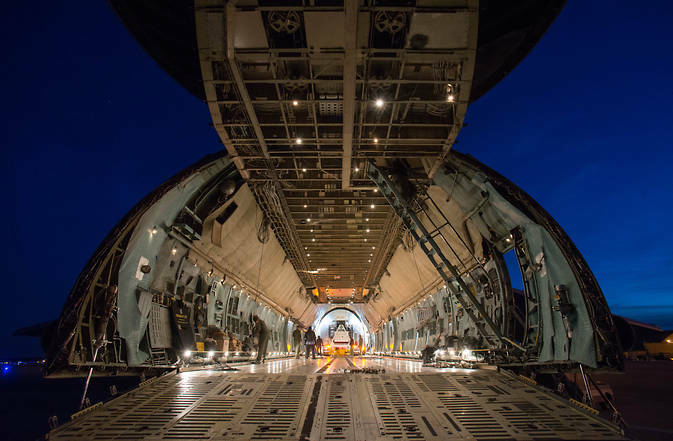 Once the massive container reached Andrews, it was loaded up into a C-5 Charlie military transport plane, the largest cargo plane in the U.S. fleet, which was designed to carry tanks. The container slid inside with very little clearance on all sides. When the C-5 landed at Ellington airport in Houston, the Pathfinder Backplane was carefully unloaded and trucked to Johnson. In the coming weeks it will be prepared for a key cryogenic test that will help the team check out testing methods for the Webb telescope. The James Webb Space Telescope is the scientific successor to NASA’s Hubble Space Telescope. It will be the most powerful space telescope ever built. JWST will see farther into the cosmos and further back in time than any other telescope, revealing the first galaxies forming 13.5 billion years ago. The telescope will also pierce through interstellar dust clouds to capture stars and planets forming in our own galaxy. The Near Infrared Camera (NIRCam) instrument for the James Webb Space Telescope (JWST) is being developed by Lockheed Martin, under contract with the University of Arizona. NIRCam is the primary science camera on JWST, and also functions as the sensor that is used to align the observatory’s primary mirror. JWST is is an international project led by NASA with its partners, the European Space Agency and the Canadian Space Agency. JWST is expected to launch in 2018.